According to state education officials, in the fall of 2013 301,528 undergraduate, graduate and professional students were enrolled at Maryland public universities and colleges, the highest in state history. Women comprised 56.7 percent of that enrollment, and Maryland residents comprised more than 90 percent of the students in community colleges, 76 percent of the undergraduate populations in the state's public four-year institutions, and 44.8 percent at independent universities and colleges. 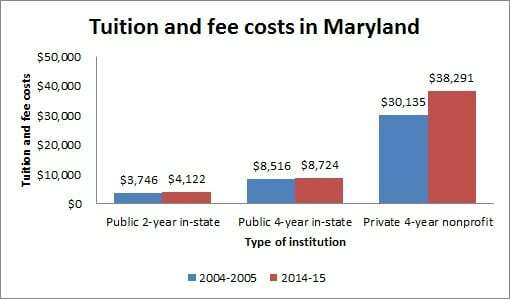 In the 2013-14 school year, the average yearly cost for resident undergraduates attending a college in Maryland was $8,309. For nonresidents, the average was $19,324. In addition to the two- and four-year universities in Maryland, there are 175 private career schools approved by the Maryland Higher Education Commission. These colleges and universities offer educational programs reviewed regularly for accreditation by the commission. For more information on which programs are accredited. The largest school in Maryland in terms of enrollment is University of Maryland, College Park, which has 37,000 students paying about $6,500 annually in in-state tuition. The highest tuition is paid at such schools as John's Hopkins, St. John's College and Washington College, where annual tuition ranges from $35,000 to $39,000. Among the public colleges in Maryland, the freshmen enrolling at College Park had the highest average SAT scores in the state in 2014, with a 636 in critical reading and a 668 in math -- both more than 100 points higher than the national averages of all high school seniors taking the SAT. Nearly 34 percent of the 138,807 students enrolled in Maryland's 16 public community colleges were full-time students, while 73 percent of the 120,000 enrolled in the state's 13 public four-year schools were full time. Among the state-aided, private institutions in Maryland, including Johns Hopkins University and Loyola University Maryland, 90 percent of 14 institutions' 28,000 students are full time. According to the Maryland Higher Education Commission's 2015 Data Book, more than 60 percent of Maryland residents have had at least some college, just above the national average. Forty-three percent have attained an associate degree, and 37 percent have a bachelor's degree, which is nearly eight percentage points higher than the national average. The graduation rate for Maryland's four-year public colleges is nearly 64 percent. That's based on a six-year period starting in 2007, and the highest graduation rate among those 11 four-year colleges was at College Park, where the rate was 84 percent. All told, there were 6,216 certificates, 15,168 associate, 31,604 bachelor's, 18,105 master's and 2,900 doctorate degrees awarded in Maryland in 2014, the higher education commission said. More than 10,000 of the 52,000 bachelor's, master's and doctorate degrees were awarded in business, by far the most popular field of study in Maryland and twice the number of the second most-popular degree, education. Between 2011 and 2013, the most recent years statistics are available, the number of credit-bearing, online undergraduate courses in Maryland grew 15 percent, from 4,483 courses to 5,170. Online graduate courses grew 20 percent, from 1,825 to 2,193. Enrollment, meanwhile, was growing in undergraduate online courses but declining somewhat for graduate students at four-year public institutions. Undergraduate enrollment in Maryland's community colleges grew nearly 7 percent, from 147,091 to 157,145, and undergraduate online enrollment for the state's four-year public institutions grew from 198,908 to 234,371, a nearly 18 percent jump. The largest growth rate for enrollment in online courses was at private institutions, however, as independent, state-aided schools increased their undergraduate online enrollment by 50 percent, from 6,769 to 10,314, while more than doubling graduate student online enrollment from 11,588 to 23,776. Maryland Online is a consortium of community colleges and universities in Maryland that offer courses online to students. The 16-year-old group includes 20 colleges in Maryland. Maryland participates in the Academic Common Market, a consortium of 15 Southern states that offers reduced tuition for students who attend schools out of state because their program is not available at a public in-state college or university. States who participate with Maryland in this program are: Alabama; Arkansas; Delaware; Florida (graduate programs); Georgia; Kentucky; Louisiana; Mississippi; Oklahoma; South Carolina; Tennessee; Texas (graduate programs); Virginia; and West Virginia. Seven percent of Maryland's 2.5 million workers are teachers, educators or librarians, so the demand in that field is always high. But according to state workforce officials, the demand in coming years for preschool, primary, secondary and special education teachers is expected to be particularly acute, with a need for 25,000 teachers by 2022. Nearly 10,000 postsecondary teachers will also be needed in Maryland. Preschool and primary school teachers need at least a bachelor's degree, while many secondary and postsecondary teachers find they need a higher-level degree to get a job. Teachers often study the field they want to teach and then earn a teaching certificate to qualify for the classroom. Business and financial operations jobs are expected to grow by about 80,000 positions in Maryland in the coming years. Financial specialists, including accountants and auditors, are going to be particularly in demand. All of these jobs require at least a bachelor's degree, although some may demand a master's degree in Business Administration, Finance, Accounting and other business-related fields. Maryland workforce experts expect to see the demand for healthcare practitioners, from doctors to diagnosticians, to grow by more than 80,000 jobs by 2022. The state expects more than 15,000 nurses to be hired in the years leading up to 2022 as demand increases and older nurses retire. While some technicians, such as respiratory therapists, can find work with an associate degree, many healthcare jobs require a bachelor's, master's or a doctoral or professional degree. Maryland expects to see a demand for nearly 50,00 managers in the coming years, as businesses grow and more executives retire. By 2022, according to the state workforce agency, there will be a need for nearly 15,000 chief executives, 13,500 general managers and nearly 10,000 operations managers. Maryland's booming high-tech industry is going to need a steady supply of scientists, analysts, computer programmers and software developers. While computer research scientists need a doctorate degree, many computer-related jobs only demand an associate or a bachelor's degree. About a third of all undergraduates in public universities in Maryland receive Pell grants. The percentage of students receiving Pell grants is highest at Coppin State (60 percent) and lowest at St. Mary's College of Maryland and the University of Maryland College Park, where only one in five undergraduates receives federal aid. Between 2011 and 2013, more than 90,000 community college students in Maryland received a total of $360 million in financial aid. The average aid amount was $3,900 during this period, while the average loan amount was $4,880. Almost an equal number of four-year students received aid, with average aid amounts topping $11,220. About 70 percent of those students also took out a loan, with the average amount being $9,300. Most of the $118 million in state grant funds come through the Howard P. Rawlings Educational Assistance Grant, which distributed more than $72 million to needy college students. College tuition varies depending on factors such as major and choice of public or private institution, but costs are on the rise everywhere. A 2014 report published by the College Board shows just how much the average cost of college has changed between 2004 and 2014. Most students who enroll at colleges and universities in Maryland will be asked to fill out the Federal Application for Student Aid (FAFSA) very early in their student career. The information recorded on your FAFSA is used by potential sources of student aid in the state and federal level to determine student eligibility and financial need. The Maryland Higher Education Commission provides resources for Maryland students who need financial aid. Its website provides links to information and applications for a variety of scholarships, from need-based grants to merit-based, occupation-based and unique-population grants. Some aid packages offered by the state-specific organizations pull the bulk of their required information from the FAFSA, but students should check with the individual agencies to see if any additional eligibility requirements must be met. Maryland helps students get assistance and scholarships for colleges in Maryland. The College Savings Plans of Maryland Board oversees the College Savings Plans of Maryland, including the Maryland Prepaid College Trust, and the Maryland College Investment Plan. The Office of Student Financial Assistance within the Maryland Higher Education Commission can also help. To find out more about some of the schools and programs available in Maryland, be sure to check out the ones featured in our school listings below.